One of the greatest encouragements I see as a youth pastor today is the growing sense of excitement (old schoolers would call it “fervor”) in young people for the things of God. And just so I’m clear: I’m talking about the God of the Bible, the God of heaven, the God of Christianity. Not Christianity the religion, but Christianity that places Jesus Christ at the center of history, at the center of their worldview, and at the center of their lives. I can see a new generation of young people side-stepping their skeptical, even nay-saying counterparts and engaging in a new, refreshing dialogue regarding the goodness and business of God on earth. It seems that being blasse’ in regards to Jesus has become passe’ among so many of the teens I see and interact with. Case in point; my oldest son is in 7th grade and this morning he left early for school to attend his school’s Bible Club. To the left is the pass he needed to be permitted to come to school early. Take a look at where the Club is being held. 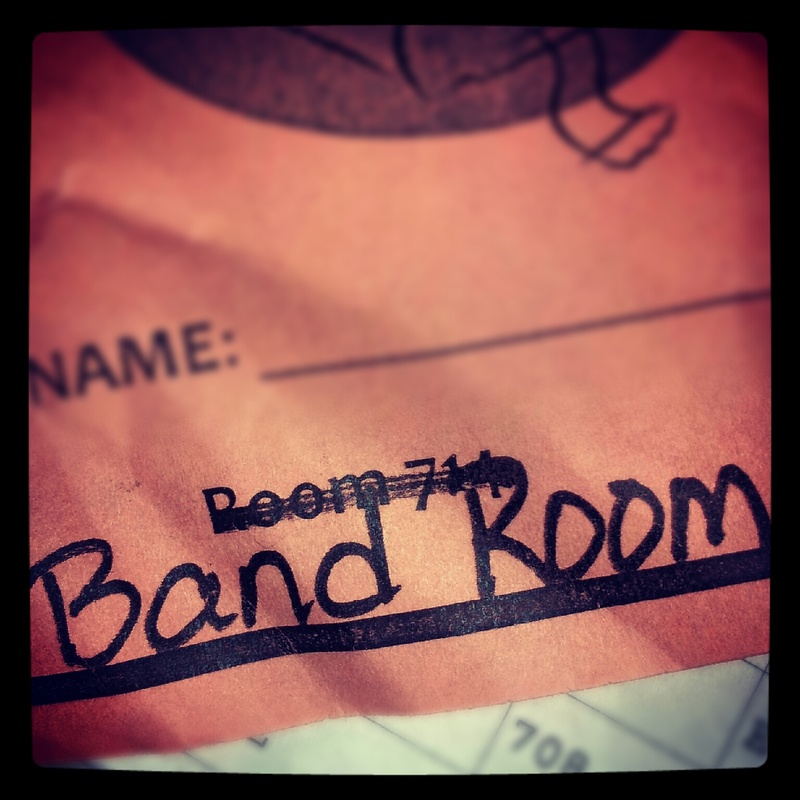 Last week it was room 714, but this week it’s the band room. Why? You guessed it: The group of students coming to a public school Bible Club was too large for room 714. And all I want to do as an adult is to fan into an even larger flame (2 Timothy 1:6) that passion for holiness, for hilarious joy, for a life of worship, for discipline, for leading a grace-dripping life that seeks not to merely exist or survive, but to thrive in the captivating presence of God. Don’t you want to have a hand in lifting them up, too? What can we as those slightly older than these young people do in order to encourage their passion for God, His Kingdom, and His graciously loving work on earth? Awesome to hear that the Bible Study has grown! It is always good to see students taking ownership in parts of the spiritual life of their community and see them be effective! Is the Bible Club student led? Yep, sure is! As per school guidelines there is a teacher present and kind of overseeing, but this is being led by an 8th grade girl. So glad to students taking initiative to be used by God on their campus! Crews sounds like another young man whom I remember helping to start a Bible club at his school. That club too had to be moved finally to the auditorium because it grew so much. And what an impact it had for the cause of the kingdom! Give my buddy a big hug for me, dude, and tell him Pop is really proud…again! Love ya.